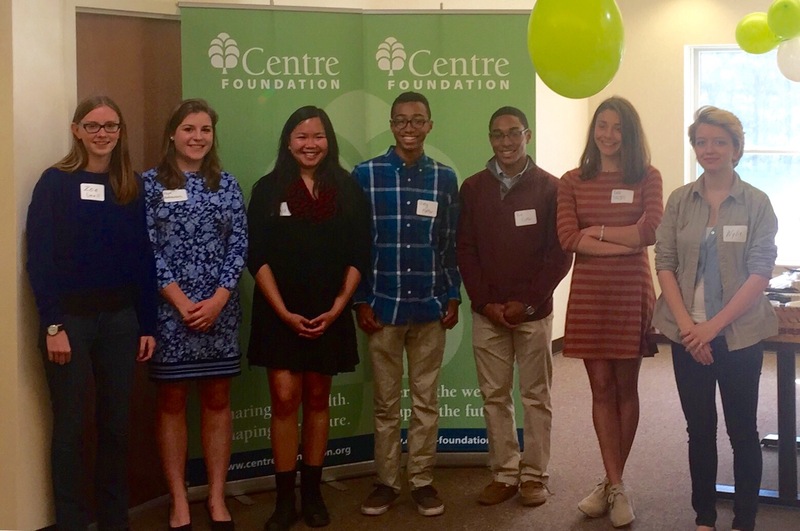 Four local non-profits received a combined total of just over $5,000 in grant money from a group of high school students in Centre Foundation’s new program, Centre PACT – Philanthropic Actions Created by Teens. The students began the year with a $1,000 granting pool provided by Centre Foundation, but quickly realized their appetite for impact was much larger. So, they began a prospecting campaign that ultimately raised $4,025 from 18 community supporters. “The students’ dedication to expanding their impact was commendable, allowing them to make grants to all four of their finalist organizations,” said Kunkel. Students, parents, community supporters, and non-profit representatives were on hand for a check presentation party (photos), which also marked the end of the program’s successful pilot year. Jaia Clingham-David gave an overview of the Centre PACT program year. Then, Zoe Small presented the first check to Centre County Library & Historical Museum’s Lisa Erickson: $687.50 for a collection of LGBTQ books and college preparatory materials. Joey and Nick Feffer presented $1,187.50 to Theresa Mast of Centre County’s YMCA for the Moshannon Valley’s “Aspire Program,” an alternative physical education credit course for students who are bullied or cannot otherwise complete gym class and do not want to receive a failing grade. Bella DiNallo and Wylie McCullough presented $1,512.50 to Marissa Vicere of the Jana Marie Foundation for their Resilience Training program, which teaches students and adults how to identify unhealthy stress levels in adolescents and make healthy recommendations. Hope Bodenschatz presented $1,637.50 to the Penns Valley Youth Center’s Darren Narber. The funds will help PVYC continue to provide a fun, safe, and welcoming place for teenagers to come after school, receive homework help, provide physical activity, healthy snacks, and build relationships with peers and adults. High School students from across Centre County are encouraged to apply to join the Centre PACT program, which aims to give participants a hands-on, student-led look at philanthropy, as well as learn about themselves, each other, and Centre County. Fall recruitment will begin as schools reopen in the fall. For more information, please visit Centre-Foundation.org or contact Irene Miller, Development & Events Coordinator (814.237.6229 | irene@centre-foundation.org).